Why not be able to share your great designs by making a mold from them?! 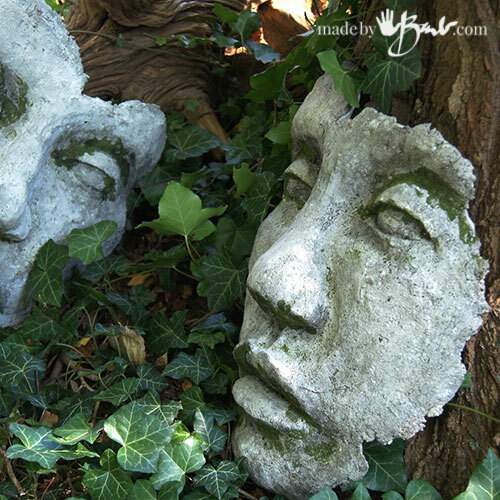 My huge face sculpture will now be able to be duplicated as I’m sure you have a few spots in your garden that could use a bit of ‘personality’! Each one will be unique even though they are cast from the same mold. 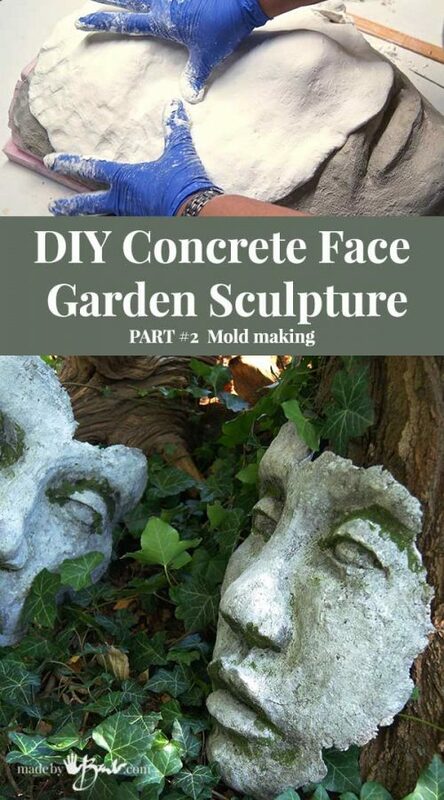 One of the easiest casting projects to make your own mossy DIY Concrete Face Garden Sculpture Mold. 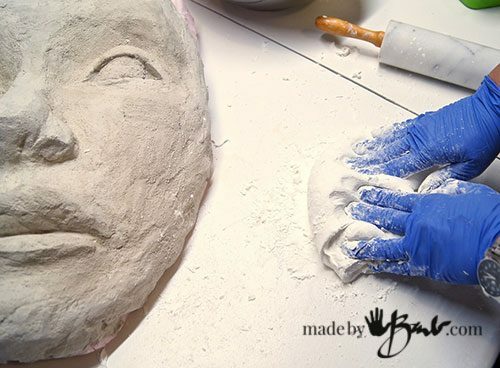 You will need some type of mask or one that you made yourself (like mine here) It was not as difficult as it may seem; you can interpret a face so many ways to be completely original and even more ‘artsy’! Myself, go big or go home! I have not added any release agent such as grease or spray to my original shape. (yes I like to live dangerously sometimes) However feel free if you suspect that your surface is going to be sticking. This concrete is somewhat rough but I also did not like the idea of greasy film on either piece. IF, you would like to add some, I would NOT suggest any cooking spray. I like using a stiff mixture of beeswax and petroleum jelly (vaseline), and scrubbing it in with a stiff brush if you want a release agent. 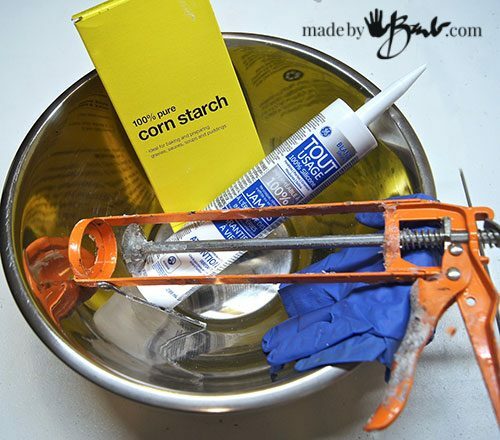 I have had much success with this method of mixing 100% silicone caulking with cornstarch. 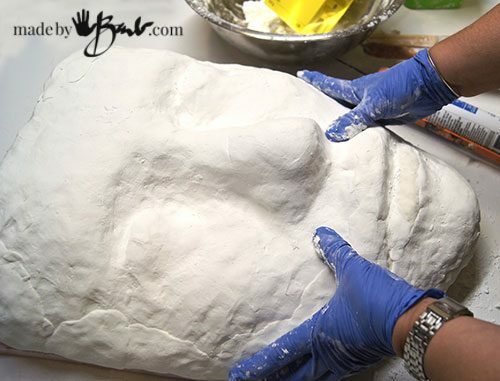 It will create a rather stiff but still flexible mold. Squeeze about as much as you think you will need (may mix up more to add if needed) This large mask used about 3 tubes total. DO have good ventilation for this as the fumes from the caulking (vinegar smell) is quite strong. 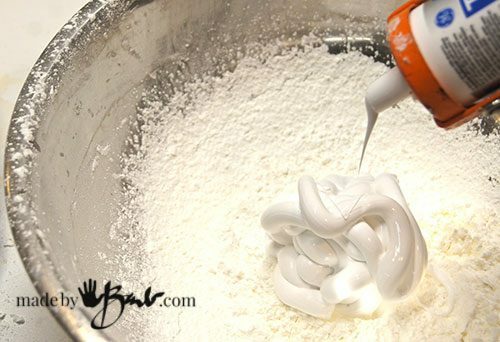 Work the cornstarch into the caulking gently and keeping it as one mound. 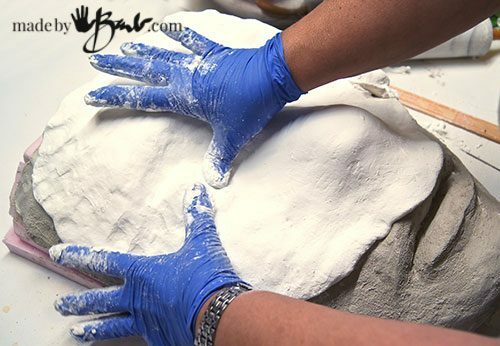 Try to keep starch between your fingers and the caulking (like working with bread dough) Keep adding and working until it starts to lose it’s stickiness. It will set fairly quickly once it does so be aware. Give the mix a good kneading to make a consistent dough (yes, I used to work at a bakery). I then transfer the slab to the shape and work it into the details. You will feel if you are thinning it too much and edges start to poke through, manipulate the ‘dough’ to cover. I had run out of caulking and had to go to the store (duh, not the best idea) and then added more afterward. It joined quite well. However if there is a repair or join that you need to make use some caulking directly as a ‘glue’. Once it is set; does not ‘squish’ when poked, it has cured. Start to peel back the edges and carefully work around all directions. It was quite ‘attached’ since I used no release agent but I was able to slowly pull it up without breaking. Since this mold is fairly thin you will need to provide some support for it. I dumped a couple bags of sand on the ground and wetted it. I can then nestle the mold nicely into it and it will hold the shape. FYI; historically, sandcasting was used quite often, even with molten iron. 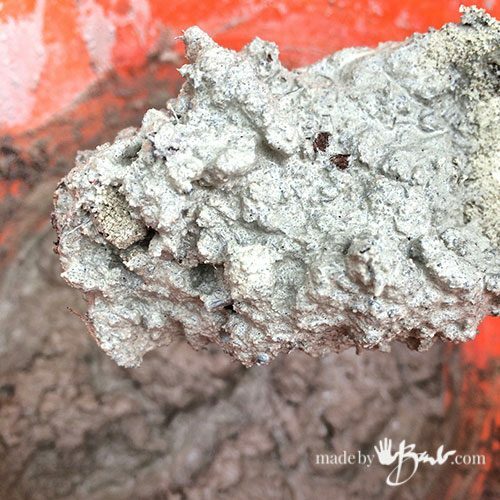 I casted quite a few ‘faces’… I used the Rapidset Cementall entirely, a mix with reinforcing fibres and a mix with some peat moss. All castings worked successfully. I like the rustic textured concrete look so added the peat into the concrete mix. It is already a very strong concrete to this did not weaken it too much. It now resembles hypertufa and is also lighter. Since this will not be that thick weight was not the issue. I have also used some colour to add some ‘age’ to the really white concrete. You can customize as you like. 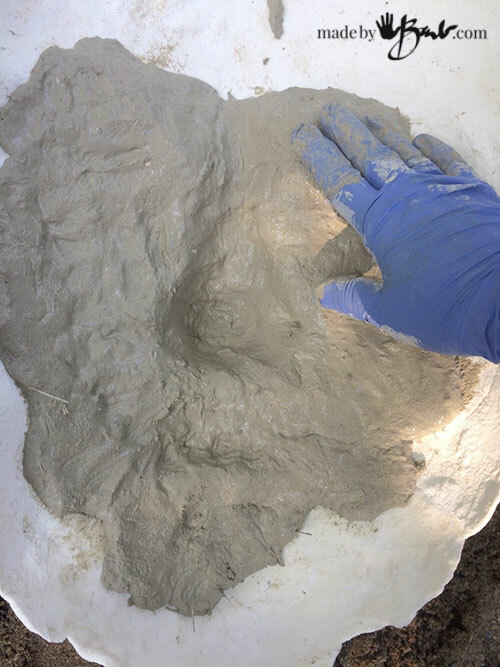 To distribute the concrete, just plop an even amount around the mold. 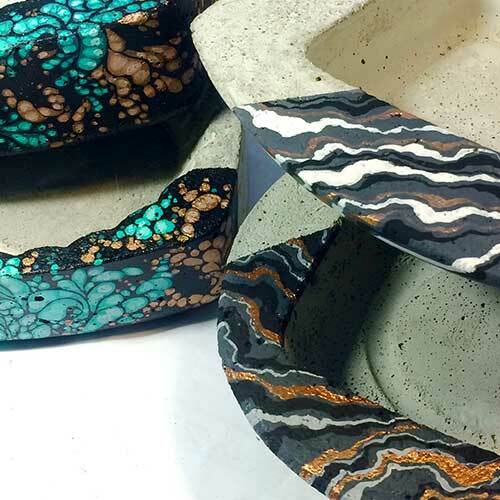 The goal is to have the edges look broken, as if it was part of an ancient old sculpture that fallen to the ground. Varying the edges will also create different looks. Smooth it into the crevices and aim for about 1/4″ – 3/8″ thickness. I am not too concerned about bubbles as it adds to the rustic texture. I have not used a mold release (again) so gently work to peel it out of the mold. When I used to use the spray it left residue that I did not like at all. It may take a bit more manipulating however it will be clean! There! I like the shapes, the broken edges, and the old-looking texture! However… I want moss on them! I’m not a ‘pink flamingo gal’. 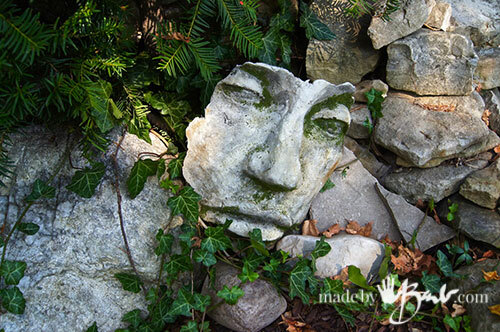 Garden art should look like it ‘belongs’ to the setting. It should feel natural, related to the media and colours… Like a pondering ‘rock’. ‘Hidden like archeological find. From what century did it belong?! Yes, moss! But this post already long enough, so it will be posted soon separately. 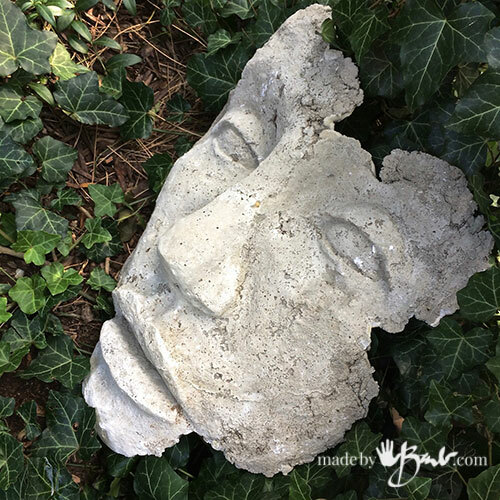 Go… make your own DIY Concrete Face Garden Sculpture! Thank you! I like that the supplies are readily available and somewhat cost effective. Were did you find your first face? Do you have it before? Does somebody have it to you? 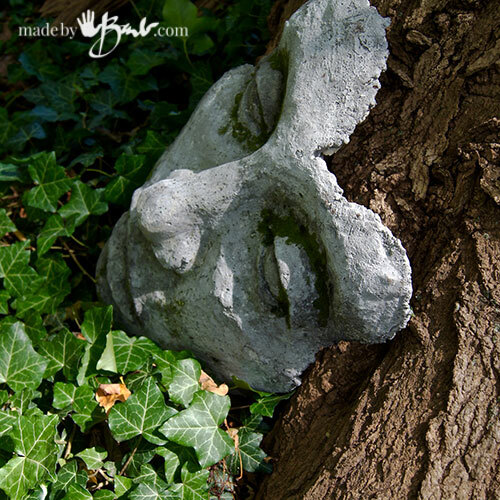 I made the first sculpture and you can see it here If you had a face sculpture that you like you could use it. I wanted one that larger than life size. Happy making! 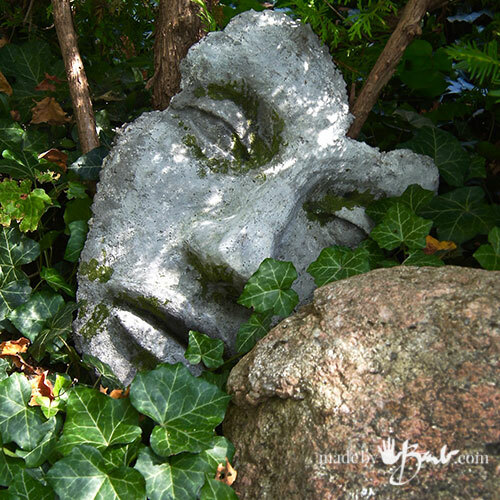 … all these faces outside in your garden – just in time for Hallowe’en – haha – so now we wait for moss tricks!!! Nice. Oh yes! 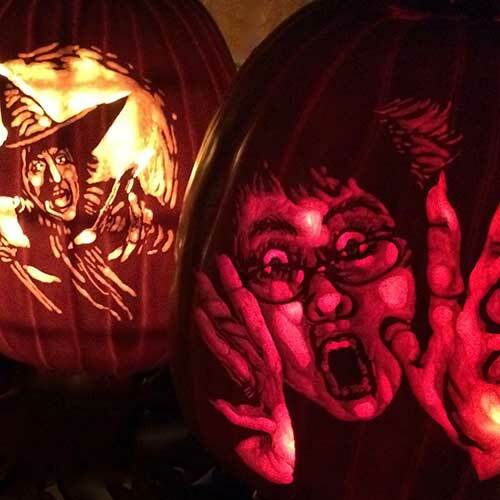 Halloween; I need to get those smiling stones into the garden by the sidewalk. It’s sad that soon enough we will be under a blanket of snow. Would love to mold my own face and others in family. How would I go about this? Great art you have created. 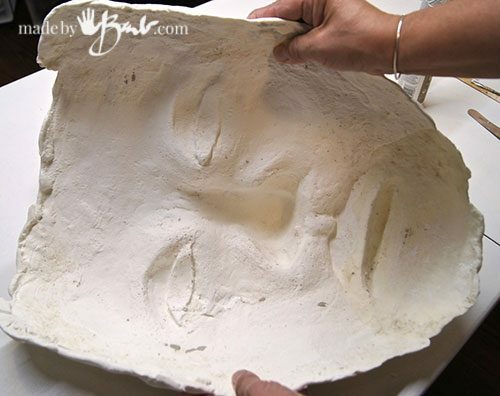 If you are thinking of making a mold of your face, it IS possible. 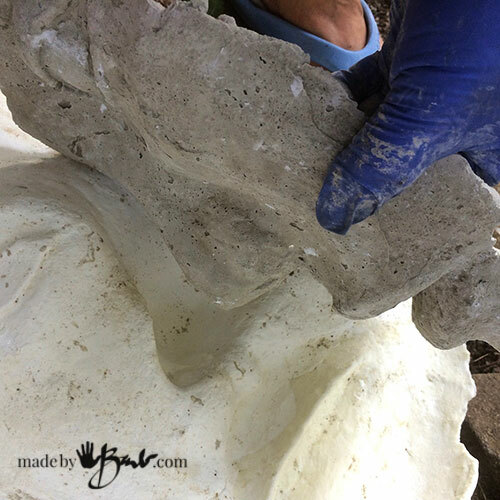 The amazing thing to use is alginate (like what dentists use) I used it for the life casting of the concrete hands It may be a bit tricky getting set up and managing to breath through a straw etc… Search ‘life casting’ and you will be amazed. 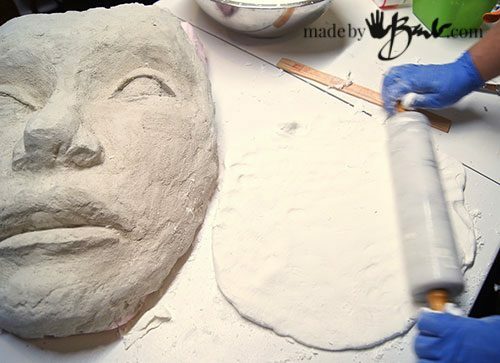 Concrete can be poured into the alginate but you can only use it as a mold once. Good luck! Love Love Love this! I’m going to try it! Thank you! barbmaker you are one talented lady wow what great ideas. Can’t wait to try this. I’m so glad I came across your blog. I’ve been wanting to make garden faces for awhile now and this is a nice tutorial on how to do it. 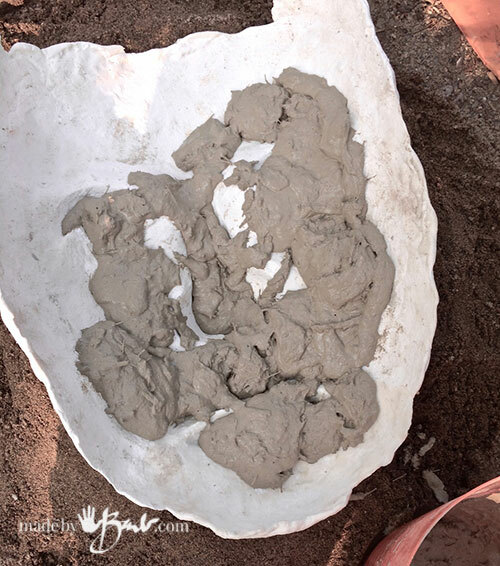 I’m curious about clean up, I’ve been hesitant to work with cement as I just don’t know what do you do with leftover if you mix too much. I love all of your ideas. Have you checked out my ‘tips post‘? I usually make small batches, especially when using the Rapidset Cementall as it sets so quick. If I need more I just mix some up. If I have extra I tend to make some ‘patties’ on a flat surface. I use these as sanding discs when hard. If I have too much I grab a couple leaves and make some small leaves to use as accents in my terrariums or garden. Hi, great tips, thank you very much. I just made a really detailed mould of a Buddha face and am pleased with it. However, I would like to add a bit more around the edges where some detail wasn’t captured. Can I just mix some more and glue it where I want the extra detail? I had something like that happen to me when I had to go buy more in the middle. I find this mix does not stick to much, as most of the time I don’t even use a release agent. When I did the second addition it stuck pretty well. 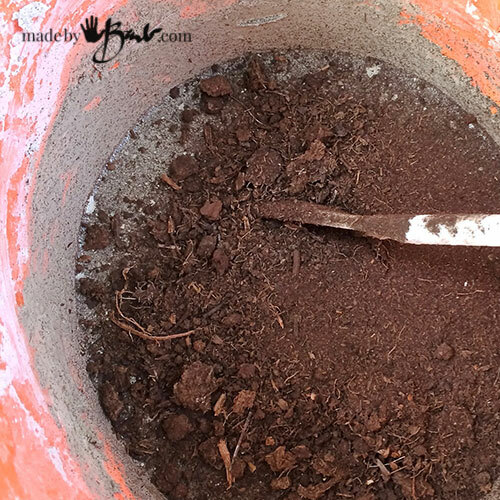 I inspected it well and saw there were a few spots where it would show a thin crack of the 2 different mixes. I just used a tiny bit of the silicone straight from the tube to use as the ‘glue’ and it adhered them well. Hope that helps. Glad to hear you gave it a shot! Hey, cool post. I really enjoy the artistic stuff. Thanks for sharing and providing an inspiration. Thanks, that’s kind to say! Yes! I consider myself an artist first and foremost. Enjoy! I had an idea in my head (which happens often)… and do get a kick out of seeing them amongst the greenery… even being buried under so much snow. murphys oil soap makes a great release agent — easy to procure, easy to clean off your original. Oh, thanks for info! It’s a nice mild soap too. Looking forward to some ‘concreting’ after a long winter! Probably my all time favorite tutorial ever! If mine turn out half as beautiful as yours I’ll be thrilled with it. Thank you SO much for posting this. I love your large heads. Wondering if you sell the molds. Thanks for sharing. I am thrilled to read your tutorials and to watch all your art. So far I have focused on the fabulous garden faces. I would LOVE to make some for myself ( or even as gifts if they get good enough ). I’m amazed by your art. You are a very creative and talented artist. I am so happy I found your blog. Thank you for sharing your art and tutorials. It is a blessing to be able to soak inspiration from talented artists. It is impressing that you take time to share and even replying to the comments. Thank you so MUCH !!! Awe, thanks! Yes, it’s been a lot of work! And sometimes I get quite weary, but I am a very stubborn artist! So enjoy while you can… Hopefully it will be worth it soon! Hi, love the garden faces., Barb. 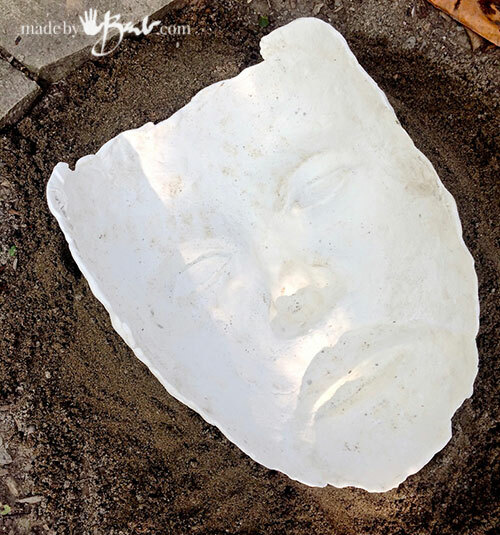 Have you ever made a face planter? 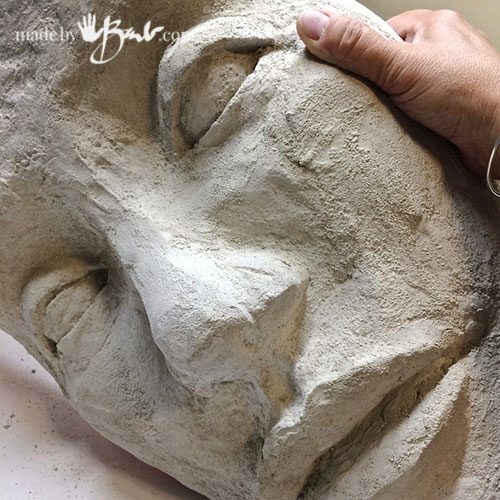 I would like to use the face as the front of a cement pot… can I either cut out a piece of a plastic bowl/ tub and attach the face mold with duct tape? 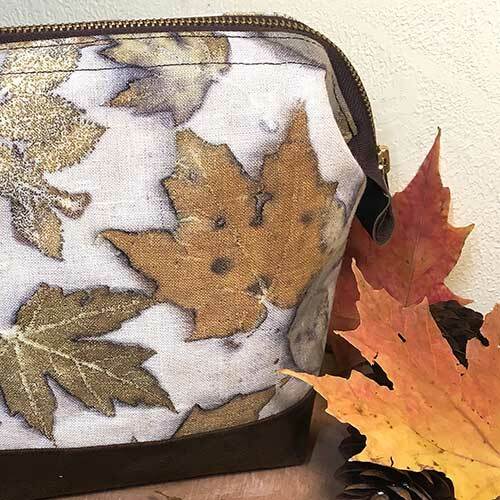 Or I thought of using a bag with a bowl in it for the mold?